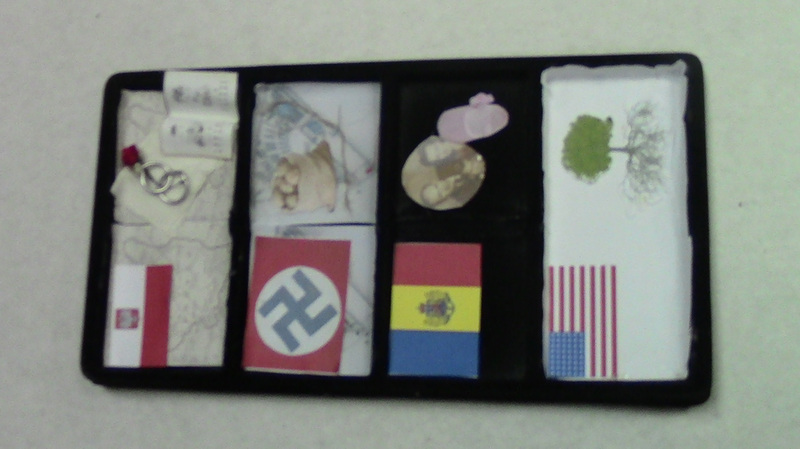 This shadow box is a vertical timeline of this honoree's life, and the places that she went. It has many symbols of her life. This honoree, Julia Haber, was born, married, and made a strong life in Poland; she even had a job as an elementary school teacher.This part of her life is represented with a small map of Poland, interlocked wedding rings, a piece of white fabric and a school book. But Julia was captured by Nazis and with her husband sent to Sachsenhausen concentration camp. Julia had to use potatoes as food so she wouldn’t starve, and potato sacks as extra clothing during the freezing temperatures of the winter. This is represented by the picture of potatoes and a string of burlap sack. In 1944, Julia and her husband were liberated by Soviet soldiers and crossed the border to Romania, where they had a child, Malvina. This is shown with the baby shoe, and a picture of the whole family smiling. Finally, Julia and her family got visas to go to the U.S. and crossed the ocean immediately. They settled down and the family grew. This is shown by the tree, which symbolizes strength over time and growth. The train tracks rattled as the cattle cars approached the station. “Are we really getting into that?” Julia whispered to her husband, Max. She trembled as she looked around at her captured community: friends, neighbors, even innocent children all pressed together by the Nazi soldiers with large guns. “Everyone get onto the cars!” Nazi shouted. The soldiers started closing in, herding them onto the cattle car. When the war broke out, Julia Haber and her husband Max were captured almost immediately from their home in Poland and sent to Sachsenhausen concentration camp in Germany. At Sachsenhausen, Julia was separated from her husband and forced to work on opposite sides of the resident farm. She had little supplies and used potato sacks as extra clothes to survive the extreme cold during the winter. When she could, Julia took potatoes from the field to eat. Doing this, she was never dangerously low on food. The couple was liberated by the Russians in 1944; theirs was one of the first camps to be liberated in the area. From the camp they crossed the border into Romania, where they had a child, Malvina. After living in Romania for a few years, they decided to travel from Romania to West Germany. From West Germany they got visas to go to the U.S, and in 1949 made the trip across the sea. They died in 2010 after living a long life in the United States. Sadly, the rest of their family was lost in the Holocaust, but they never lost hope. Before the Holocaust, Julia Haber was an elementary- school teacher. She met Max in the early 1920’s, right after she graduated from college, and they got married in the late 20’s. They lived a happy life, without knowing what was to happen to their life and family.